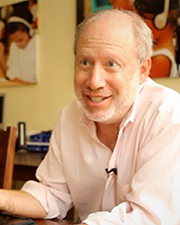 Seth Weinberger is the founder of Innovations for Learning (IFL) and the developer of its first software programs. Innovations for Learning, a social benefit organization focused on improving reading instruction in the primary grades. Since 1993 Seth has pioneered using digital technology to connect teachers and students to a galaxy of resources to help students learn to read. His “TeacherMate” literacy system was one of the early examples of how technology can improve reading substantially. IFL’s current “TutorMate” program engages tutors who volunteer their time and skills, connecting over the Internet with students in need of help. Seth also is a co-founder of the Cherry Preschool in Evanston, Illinois. He is retired from the international law firm Mayer Brown, where he was a partner and associate in its Global Information Technology practice for more than 25 years. Seth received both a bachelor of arts degree in economics and a J.D. from the University of Michigan.